https://sep.yimg.com/ay/yhst-33477391359232/boxfish-black-female-ostracion-meleagris-box-fish-6.jpgBoxfish Black Female - Ostracion meleagris - Box Fish Expert Only!!! Not Cover Under Arrive GuaranteedSemi-aggressive55 Gallon6.3 inchesYes, with CautionOmnivore, BrineIndo-PacificOstraciidaeSmall 1" - 2"
Boxfish belong to the Ostraciidae family, and are often referred to as Trunkfish or Cowfish. Most of these fish are members of the genera Ostracion, Lactoria, or Tetrasomus. Boxfish reach an average size of three inches in an aquarium, while in the wild, they can grow to over 19 inches in length. Boxfish are closely related to both Puffers and Filefish. In most cases male Boxfish are larger and more colorful than their female counterpart. Boxfish are comical little fishes that really do look like a box! They have a stiff cube shaped body that is covered with a hard bony armor. This provides excellent protection for these slow swimming fishes but they are also able to secrete a deadly toxin when they are in danger, the result could be a total wipe out of the entire community tank, so choose their tankmates carefully. Boxfish are easily recognized by their distinctive square or boxlike shapes. Their sides are actually bony plates covered by a thin skin. This becomes important if there are so-called cleaner fish in your tank, as the Cowfish's delicate skin may not tolerate this behavior. Two pairs of bony horns distinguish the Cowfish - one on the head and one just above the caudal fin. The horn-like protrusions from the head and above the caudal fin serve to deter predators. Some Boxfish have the ability to release a toxin called ostracitoxin, which is used to ward off predators. It is important to note that if this toxin is released into the aquarium, all the tank inhabitants can be killed, although this does not occur often. Only the fins of the Cowfish are moveable, which they use to slowly propel themselves through the water. Since they have poorer locomotion, it is necessary to carefully monitor their eating habits, since more aggressive tank mates may prevent them from reaching the food. Cowfish are omnivorous bottom feeders, consuming both algae and crustaceans and sampling polyps on occasion. Boxfish are found throughout the world, and are most commonly associated with coral reefs. They can also be found near rocky areas, sand flats or grass beds. Most of these fish are found in harems of one male and several females. The breeding of these fish in an aquarium is extremely difficult. Boxfish Care Boxfish are generally peaceful and they definitely require peaceful, slow moving tankmates like themselves, do not house them with aggressive eaters. As mentioned earlier, they are capable of releasing a lethal toxin when they are stressed so "bullies" in the tank need to be removed. Be cautious when introducing them in a reef tank since they will often nibble at tubeworms. 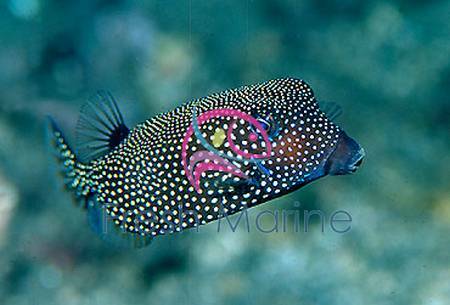 Maximum Size: The Boxfish Grow upto 19 inches in length. Habitat: Boxfish occurs in tropical and temperate marine waters of the Indo-West Pacific, including Indonesia, New Guinea, north to the Philippine Islands and east to Fiji and French Polynesia. Natural Environment: Boxfish are found throughout the world, and are most commonly associated with coral reefs. They can also be found near rocky areas, sand flats or grass beds. Feeding and Diet: Boxfish feeds on a range of benthic (glossary) organisms such as molluscs, crustaceans, fishes, sand-dwelling polychaete worms and algae.